Find free pictures, photos, drawings, images, facts and information related to a wide range of dinosaurs right here at Science Kids. 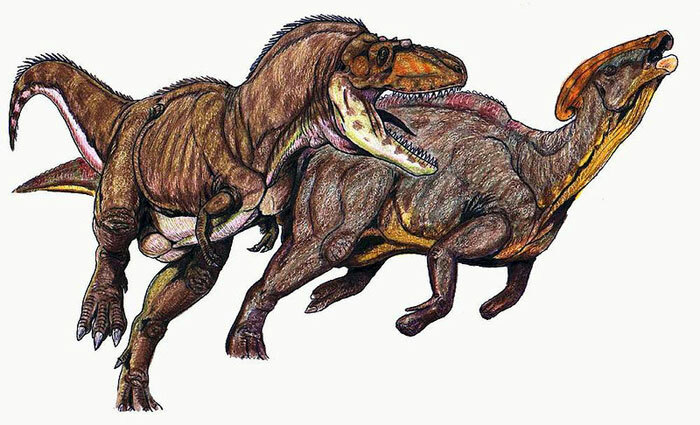 Facts & description: This drawing shows the possible appearance of a Gorgosaurus as it attacks a Parasaurolophus. Gorgosaurus was a Theropod that lived in the late Cretaceous Period (around 75 million years ago). It lived in North America and was from the same family of dinosaurs as the Tyrannosaurus rex, featuring small arms, sharp teeth and a length of around 9 metres (30 feet).